This layout is a simple to use resume template that is straightforward and direct to the point, making the facts within readily attainable. For the few seconds human resource personnel spend viewing the resumes job applicants submit, the facts presented on the page must instantly be realized. The spacing of this design causes the info to be evenly distributed on the page in a linear fashion. The applicant's name, address and other contact information are listed one on top of another. The name uses a font size that is 120 percent larger than the rest. The other words on the page are all the same font size and font face. All the words are aligned to the left including the section titles, which are all caps and are underlined. The underlined section titles effectively separate each section. The dates are listed first on the associated lines, on the same line are the institution and business names, followed by the city and state of each school and workplace. The position titles and university degrees are bold face and are listed next under the lines with the dates. Next comes the facts that are listed in short bulleted sentences. 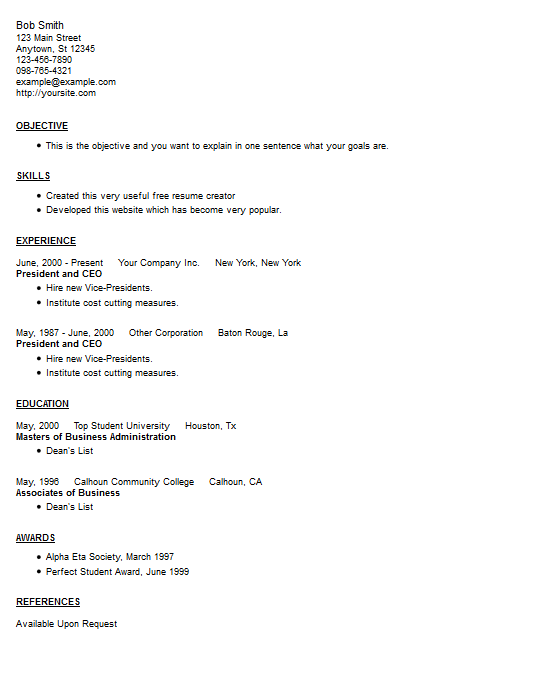 This is a very simple template to use and customize, you can grab it at our resume creator. You are free to read this article to avoid some of the worst resume mistakes and this other one about picking keywords to add into your writing.